To start, you need to be honest about the content you have. Most likely, your organization has plenty of feature- and benefit-related content — truly, the majority of brands have become quite adept at talking about themselves. We clearly don’t need more of that kind of content, especially when that type of information is only useful for a very small part of a buyer’s journey. What brands lack are stories that engage their customers — and drive customers and prospects to take a desired action. 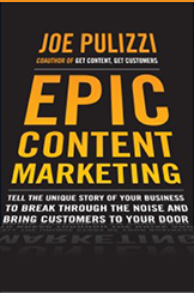 Below, I’ll review the six key principles of epic content marketing in more detail. But before I do, let me remind everyone that the ultimate goal of our content marketing efforts is to “move” the customer in some way. We need to positively affect them, engage them, and do whatever is necessary to play a useful role in their lives and their conversations. Epic content fills a need: Your content should address some unmet need or answer a question your customers have. It needs to be useful to them in some way — above and beyond what you offer in the way of products and/or services. In some cases, it may fill an emotional need (like Coca-Cola’s content and Red Bull’s storytelling efforts aim to do). It communicates consistently: The primary hallmark of a successful publisher is consistency, both in terms of quality and delivery. Epic content reliably delivers on the promises your brand makes. Whether you are asking your audience to subscribe to a monthly magazine or daily email newsletter, you must ensure that they receive what they signed up for and that it always arrives on time and as expected. This is where so many companies fall down. It requires you to find your unique, and human, voice: The benefits of not being a journalistic entity is that you have nothing to hold you back from being… well… you. Find what your voice is and share it. If your company’s story is all about humor, share that. If it’s a bit sarcastic, that’s okay too. It expresses a point of view: This is not encyclopedia content. You are not giving a history report. Don’t be afraid to take sides on matters that can position you and your company as an expert. Chipotle’s runaway viral hit The Scarecrow clearly has a point of view — that locally sourced and responsibly produced food is, well, superior to how most food is processed today. Don’t be afraid to take stances like this. It is devoid of “sales speak”: At Content Marketing Institute, when we create a piece of content that is about us vs. an educational post, it only garners 25 percent of the average page views and social shares our content normally drives. The more you talk about yourself, the less people will share and spread your story. It’s that simple. It’s recognized as the best of its breed: Though you might not be able to achieve this at the very beginning, the ultimate goal for your content is to be considered the best in its class. I know it may sound overly simplified, but if you expect your customers to spend time with your content, you must deliver amazing value to them, and nothing less. Take some time to look at your content marketing strategy. How many of these six principles are you achieving in your content efforts? Think about the content sources that you rely on every day. What makes them so special? Do they provide information that you can’t find anywhere else? Are they consistently delivered at the same day and time? Do they express a particular point of view that you subscribe to? Does the information you get from them help you live a better life or grow at your career? Inc. Magazine (a media company) — I actually get excited when this print publication comes in the mail. Monthly frequency. Seth Godin’s daily blog posts (an author). Daily frequency. Quarterly reports from Fisher Investments (an investment firm). Quarterly frequency. Copyblogger Media’s daily posts (a software company). Daily frequency. As a business, your content marketing goal is to become part of the fabric of your customers’ lives. Once you can do that, selling to them becomes relatively easy. What you might find interesting about the above examples is that I’ve purchased multiple products from all of the companies above, even though they give away so much value for free. That’s exactly what you need to do with your content marketing. The good news is that we can all be epic — if we follow these six principles. Good luck! Portions of this post were excerpted from Joe’s latest book, “Epic Content Marketing: How to Tell a Different Story, Break Through the Clutter, and Win More Customers by Marketing Less.” Buy the book today and you’ll be entered into a raffle to win a free video-on-demand subscription to view all the sessions from Content Marketing World 2013 — a $595 value. Click here for contest details.